It’s May!! This means that statistics are out for the first month of the Spring market and everyone is writing about something different, with a different spin and a different angle. It could be good or it could be bad – it all just depends on how you interpret the numbers. 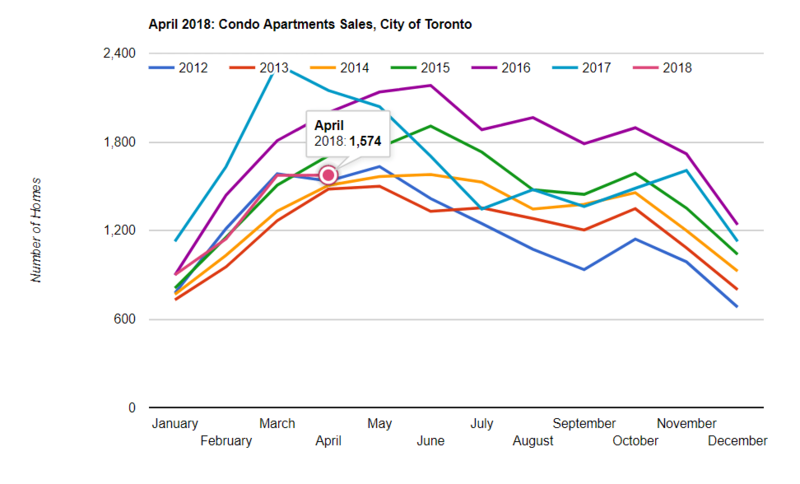 So I wanted to dedicate this week’s Insight Article to give you a comprehensive breakdown of the Toronto condo market to date. Terms, Explained – Before we get started, here are a few statistical definitions to help you get started so that you can better understand the charts and graphs below. Median Price – This is the middle price out of all the sales. Half of the properties sold are over this median price, while half of the properties sold fall below this price. Average Price – This is the number that everybody talks about. The sum of all of the sales prices divided by the total number of sales. Cons: In real estate, the average can be skewed by luxury sales such as condo penthouses. Benchmark Price – MLS came up with this stat that removes the outliers. This price is determined by the most popular type of asset class and the value of the characteristics determined by the home buyer purchased in a specific area. 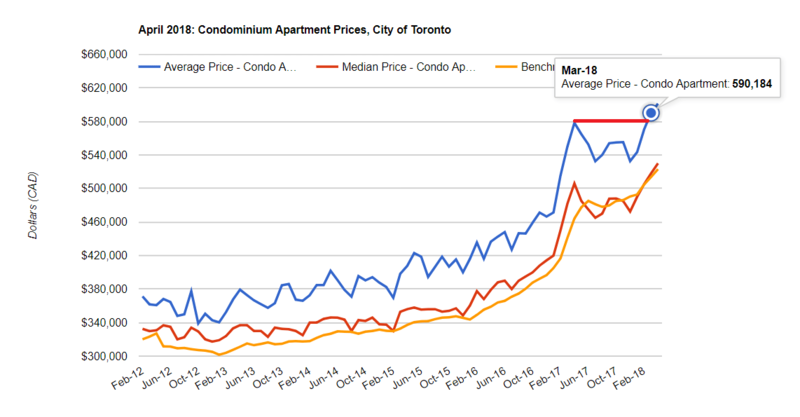 The Story of the Rising Condo Prices – So here are the stats for the Toronto condo market, all summarized in an easy-to-read chart. 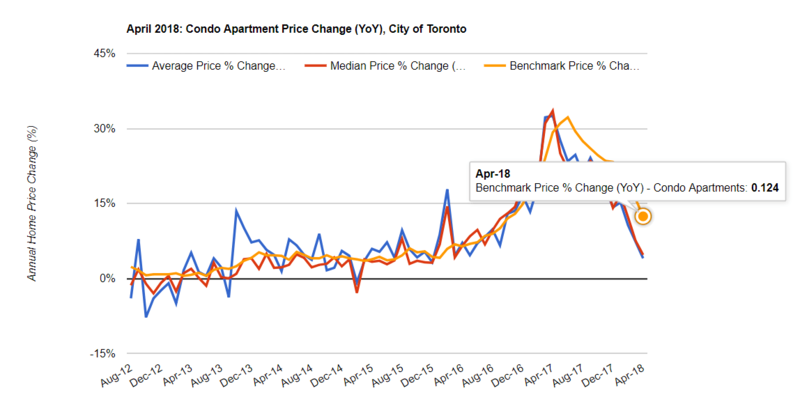 You’ll notice that despite prices being at an all-time high last April, condo prices are still even higher right now because there was never a slowdown. The 4% year-over-year increase during our so-called “crash” is quite the spectacular feat, wouldn’t you say? The benchmark increased by 12.4% because the value of condos from the buyer’s perspective has gone up significantly (due to high demand). As illustrated by Graph A above, take note of the price plummet since April of 2017 and the bounce back to the peak in March 2018. Overall, there has been a general steady rise in prices month-over-month since 2012. Graph B below indicates the year-over-year price changes. You’ll notice that all percentage changes are still above the 0% line, which means that despite what the chart may look like upon first glance, prices are still in fact increasing, albeit just at a slower rate. Now that prices have increased further and we have surpassed the 2017 peak according to Graph A, you can expect the line in Graph B to trend upwards in the coming months as prices will likely increase at a faster pace with the start of the Spring market. However, many real estate pessimists are predicting that prices will keep plummeting, but let me ask you this question to ponder: If we were in a so-called “crash”, then why are the stats in Graph B still above the 0% line (i.e., prices were still increasing year-over-year during the “crash”)? Below are two graphs that show the number of sales that have occurred from 2012 to the present day, by month. The red line represents 2018. As expected, the Spring market usually has the most activity, as illustrated by the peaks each year between April to June. However, this year we only hit about 67%of the sales that we hit last year (1,574 in 2018 compared to 2,324 in 2017). This is precisely why you are seeing some news headlines that read something like “real estate sales down 33% (100% – 67%)”. This second graph below shows the number of active listings from 2012 to 2018. Again, the red line represents year-to-date 2018. In order to generate sales, we need listings; if there’s no listing, then there’s nothing to sell. You can see that we had slightly more listings in 2018 vs 2017, but one of the reasons the prices jumped the way it did last year was because the demand for properties completely outpaced the amount of supply (i.e., due to a low number of listings). As evident from the graph, all of the years prior to 2017 had plenty of supply, with upwards of 5,000 listings at the peaks in Graph D compared to 2,130 listings in April 2018. To be in a healthy market, demand needs to be balanced with supply. The Demand Says List It! This last chart below highlights the Sales to New Listings Ratio (SNLR) in the last 3 April months (2016-2018). Historically speaking, if the SNLR is over 50%, then this would indicate a seller’s market whereas if the SNLR is below 50%, it would be a buyer’s market. The sales to new listing ratio was about 55% in April of 2016, which signifies a super healthy and balanced market – this is why we deemed 2016 to be a normal year for the purposes of being a point of reference. In April of 2017, the SNLR was an absurd 121%, which means that there were more sales than new listings. You may be wondering, well how is that possible? This means that listings from the previous months that didn’t get sold was subsequently purchased in April 2017. Now, let’s take a look at this year’s condo SNLR. 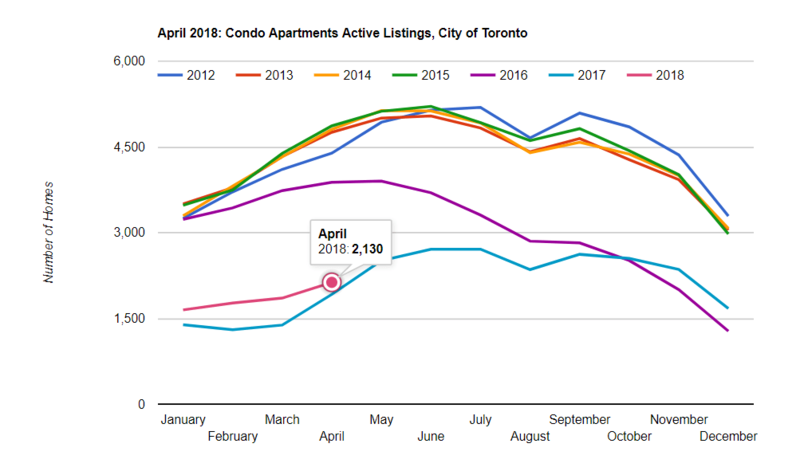 For the month of April 2018, we’re at a strong 73%, which is clearly indicative of the demand for Toronto condos. Unless there is more supply, this demand isn’t going away anytime soon. With the City of Toronto slowing down the residential development process, we could very well be in a supply crunch for the foreseeable future. The Wrap – To conclude, it is fairly obvious that the Toronto condo market is very, very strong right now and it will likely continue as this is the only means of affordable housing for the average person. Is this a peak for condos and are the pessimists right that a crash is looming? Based on all of the stats so far, this is likely not the last of the peak. Prices will continue to rise as we have yet to get to the point where buying any property for the average person is impossible. In a few years though, if the same overall trend continues, the current entry condo purchasers may very well become permanent renters. It’s really a matter of either owning assets that go with the market, such as real estate and stocks, or otherwise forever chasing these assets with an income that won’t increase nearly as fast. Next Next post: Predicting the Future… Back in 1990!